New to live plants in the aquarium? Perhaps you have never tried them before. Maybe you have, and it didn't go too well. If you’re a beginner, look no further! These plants are a beginner’s paradise, but are also staples in the hobby. Hard to kill, no specific substrate needed, no additional fertilizers needed, and minimal light is needed for these monsters. Java Fern – I’m in love with Microsorium pteropus and all of its variations. You cannot go wrong with this plant, buy it big or small, plant it or stick to driftwood or rocks, it does not care. Give it water and a little bit of light and it will be producing babies in no time! Anubias – In the same realm as the java fern, Anubias barteri and its variations (nana, nana petite, coffeefolia) do not need to be planted and don’t require much light. Stick with this species and you will get some great looking plants for your foreground or attached to your décor pieces. Water Sprite – Another fern that won’t let you down. Plant it or float it, Ceratopteris siliquosa and thalictroides will add some great dimension to your aquarium. Water Wisteria – One of the few stem plants that I recommend for beginners, Hygrophila difformis will shoot its roots to whatever is nearby! Easy to propagate as well! 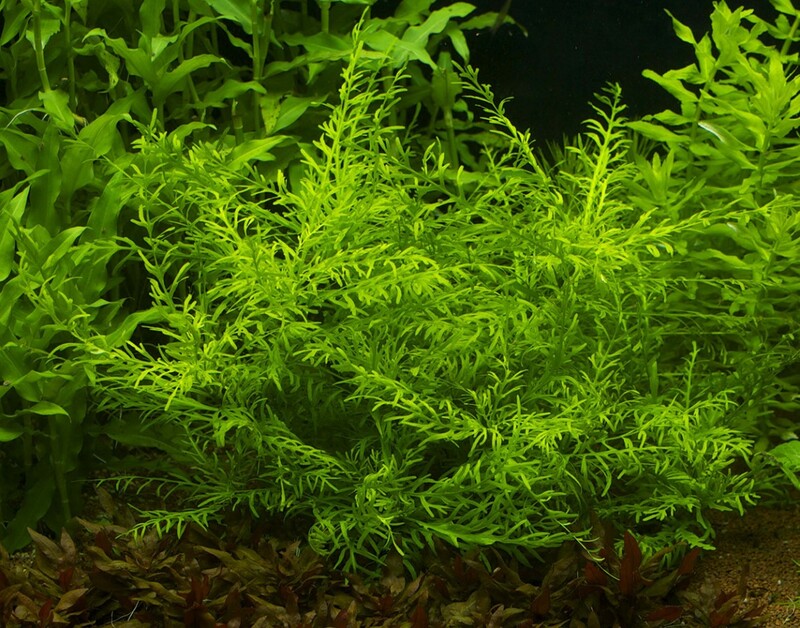 Hornwort – Ceratophyllum demersum, planted or floating, will overtake your tank in no time if given a lot of light. It’s great if you are getting algae and need something to absorb the excess nutrients, or if you have any live bearing fish, the fry can find great protection in this. Crypts – Green Cryptocoryne (balansae, retrospiralis, wendtii and parva) make great beginner plants. They don’t need much light as long as they have the elements they need to feed. Avoid any red or brown crypts, or any red plants in general, if you are a beginner. Java Moss – a little bit of Vesicularia dubyaya goes a long way. This stuff is nearly impossible to kill and it’s great for fry and shrimp! Amazon Swords – Echinodorus sp. amazon swords have an amazing root system and are very hardy. You will want to make sure you trim off any leaves that show discoloration and it will continue to grow until it reaches out of your tank! Stick to these options and you won’t be disappointed! Very difficult to kill and great for a beginner to learn the foundations of keeping a planted aquarium without having to break the bank! Ray’s professional background is in governance, risk management, and compliance. By day, he is a mild-mannered business professional; by night, he becomes a mad scientist of planted tanks. His true passion lies in creating self-sustaining aquatic ecosystems through meddling with the forces of nature. He has that old school style – cutting his teeth with Pelvicachromis pulcher, ultimately falling in love with Apistogramma and other dwarf cichlids. You’ll be able to find tips and tricks from him all throughout the website.